POINT LOMA — A crew from Coast Guard Aids to Navigation Team San Diego replaced the VM100 Fog Detector at the Point Loma Lighthouse Nov. 13, after the current detector was deemed faulty. The detector, which sends a laser signal out that can determine the density and range of fog, was determined to need a replacement during a routine inspection of the light Nov. 6. The fog detector determines if there is fog nearby with its laser signal, and in turn activates the fog signal — if needed — to warn boaters. According to the Coast Guard, the faulty fog detector was discovered and replaced prior to any discrepancies occurring. The new detector will be able to determine both the density and range of the fog. 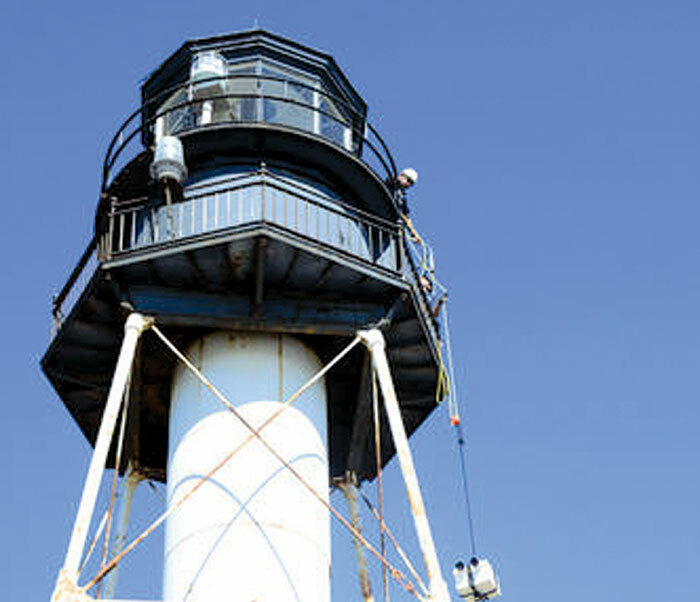 The fog detector is paramount to the purpose of the Coast Guard-manned lighthouses along the coastline, and was actually the reason the New Point Loma Lighthouse was constructed in the first place. The original or “Old” Point Loma Lighthouse was constructed in 1855, and even at its creation, questions regarding the building’s location 422 feet above sea level but recessed from the water’s edge arose and, ultimately, doomed the structure, as its light was often obscured by fog and low clouds. Just 36 years from the construction of the original lighthouse, a new Point Loma Lighthouse went up at the very tip of Point Loma’s peninsula, completed in 1899 and acting as the coastal beacon for approaching vessels to San Diego Bay. On Nov. 15, the Old Point Loma Lighthouse celebrated the 157th anniversary of its first lighting. Visitors were allowed on tours showcasing areas of the lighthouse not normally open to the public including the top of the tower where the Fresnel lens is housed and the walkway around the outside known as the gallery. When it was in operation — and the clouds and fog lifted — the light could be seen from 26 miles or more away.